It always not too late to get started on a new exercise of training regime. We can start as we mean to go on and get rid of a few pounds. The problem for all those with a love of cycling is that the weather may have other ideas. It can get a bit wet and windy for a trip on on the mountain trails, or a little icy on the roads for road cycling. A good exercise bike can help cyclists to find their rhythm and get back into shape – while they wait for the weather to clear, and the temperatures to rise. The following models are those of the best examples for 2019. These top ranked exercise bikes showcase some of the best mechanisms, features and programs to get cyclists started in a productive, beneficial manner. There should be something here to suit most needs. 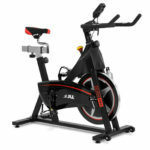 Why is the JTX Cyclo 6 Exercise Bike so highly recommendable for 2019? This is a stationary bike that is designed to do pretty much anything that users need. This means a secure build for regular training, as well as spin bike sessions, high intensity interval training and other cardio workouts. This is made possible by that gym-ready build, as well as the chance to enjoy infinity resistance system from the tough 22kg flywheel and smooth belt. There are few concerns about longevity and reliability here. It can handle a tough pace, as well as a gentle cool down session. This JTX CYCLO-6 Indoor Cycling Bike is also classed as a “multi-adjustable” indoor bike, which means that it should be suitable for a whole range of different users. This means shorter users that want to stand and spin, and taller users that want a slow, steady approach to training. Users can adjust the bike via four directions to change the posture and height. This improves the comfort. As for that idea of portability, there is a large size and weight to this machine at 131 cm long and 64kg. Yet, there are still transport wheels for easy manoeuvrability. 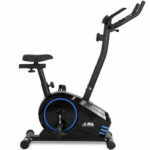 Why is the DKN AM-E Exercise Bike so highly recommendable? it is also pretty comfortable for most users. Many of these top rated exercise bikes focus on a smaller, gentler approach to appeal to those working out at home. This model is a little different. This is still suitable for apartment use, but there is a more heavy-duty, gym-ready feel to the build and features. The first thing that is immediately clear with this model is that it is the polar opposite to the one above. This is a much sleeker, less intimidating machine that looks much nicer in the home gym. 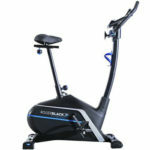 This bike has a 8kg flywheel for smooth, quiet motions and 32 resistance levels for impressive progression. The machine itself is large and well built with a user weight allowance of 140kg. But, it does have the added bonus of transport wheel on the bottom. That tough frame is also adjustable so users can find the right seat height and distance from the handlebars. 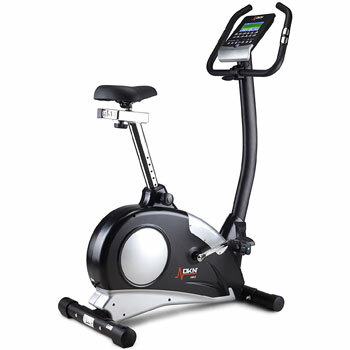 The series of 12 workouts and large LCD console mean that users can get a great workout. The additional chest strap measure their heart rate and they can see data on this, distance, calories, speed and more. The DKN gym bike seems not a powerful model for HIIT workout. The flywheel is a bit weaker and the frame is minimal. 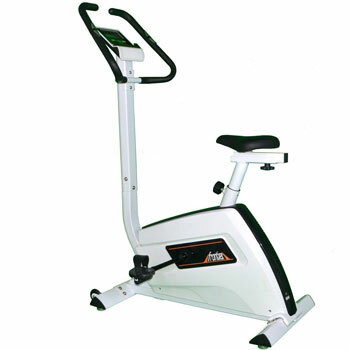 In fact, there is an “ergonomically-designed” lower frame to help users get on and off the machine with ease. Which is important for all those put off by gym machines and spin bikes that want an easier starting point and also suggests the bike machine is better suited to beginners. However, there is more on this model than some would expect. There are actually 32 states of electronic resistance here, so plenty of room for progression, as well as 12 different pre-set workout programmes. The DKN AM-E bike also has a nice, clear Blue LCD console with information on the users heart rate – via pulse grip sensors – and their time, distance and speed. In conclusion, the DKN exercise bike has a nice blend of comfortable, user friendly elements and high-end programming here. This should ensure that newcomers can work from the very bottom up towards better fitness. Folding exercise bikes such as the Ultrasport F-Bike are appealing to many different users. The collapsible frame and simple build appeal to apartment owners, as does the promise of simple assembly for home use. This product also boasts a smart console and 8 resistance levels for a good workout. Ultrasport call this a “robust stamina builder”, but would users agree? This Ultrasport Apartment Friendly F-Bike has an impressive list of features to help users achieve the best possible workout at home. The main selling point of this model is that fact that it is an apartment-friendly model for everyday use. This is clear from the compact size and the handy folding frame. This allows users to store it away with ease when not required. There is also the added bonus that it doesn’t generate a lot of noise while in motion either. Even though this is mostly about the shape and design, many users find that they can still achieve a great workout from this gym bike. The resistance levels are good enough that buyers can work up a sweat and test their fitness levels. Some even trust the bike enough to try for some high-intensity spinning. The 220lb weight allowance definitely helps here. Whatever the purpose most users find that they can keep up with their progress pretty well. There is an easy-to-read console on board with a display for time, speed, distance, calories and pulse. The pulse sensors are conveniently located in the handlebars. This is another helpful design feature to add to the list. The issue here is that the workout from this Ultrasport Exercise Bike is better suited to taller users. The biggest problem with this product is the height of the seat. This was not built for shorter users, as those around 5ft2 and under struggle to reach the pedals. This also means that there is some difficulty in climbing onboard. This means is is doubly beneficial that this is such a strong build. Finally, there is small issue with the comfort of the saddle. This is common problem, but even more annoying here where users struggle to climb on. It is interesting that the Ultrasport Comfort Saddle Cover is a recommended add-on purchase here, so Ultrasport are aware of the issue. How does this all affect the final verdict on this Ultrasport Folding F-Bike Home Trainer? There are some areas where Ultrasport could improve on the design of this exercise machine. The functions and workout offered are great for a simple home workout, but it would be more appealing to a wider audience with more seat height adjustments and a better saddle. As it stands, this Ultrasport F-Bike is still a great option for taller users that want something small and convenient for everyday use. Why is the Roger Black Gold Magnetic Exercise Bike so highly recommendable? There are plenty of “Roger Black” branded exercise machines catching the eye of consumers in 2019. This Gold bike is one of them. It all starts with the range of programmes. There are 12 in total, including 6 pre-set options, 1 for body fat and 1 for your target heart rate. It can get as tough as users need it to, but does so in comfort. There are nice grips on the handlebars, secure, self-levelling pedals and a decent seat. There is also the bonus of the iPad and water bottle holders for added convenience. The beauty of this machine does lie with all those little details and careful considerations. However, there are also plenty of basic aspects to the machine that the designers get right. The first is the amount of adjustable elements to suit different users. There is both an adjustable seat and adjustable handlebar. This means that more members of the household can benefit from this design. This is also helping for encouraging new users, as is the ease of use of the console and gentle approach. The display offers information on time, rpm, speed and heart rate. While there is only a 6kg flywheel, there are still 16 resistance levels to choose from. 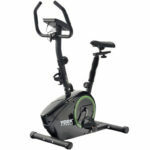 This York fitness bike is sold as a model that is ideal for those at a beginner level. This is meant to be the attractive, comfortable device that users turn to when they first start out. 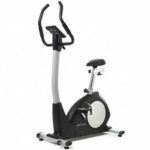 The range of adjustable elements and comfort features on this fitness bike go a long way to providing that. It all starts with the promise of an extra large padded seat, while other models have more traditional, harder saddles. There is also padding on the handlebars, and the ability to change the height and reach to suit different riding positions. Once users are settled into a position they find comfortable, they can turn to the programming and settings of their choice. There is the choice of 8 magnetic resistance levels and 4 programs, including a helpful fitness test. The 4kg flywheel, LCD screen for basic data and hand pulse sensors allow for a great session. The additions of the self-levelling pedals and the bottle holder are nice touches too. 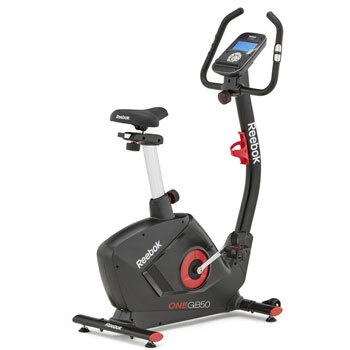 The term stationary bike is one applied to the name of this Reebok model. This seems like an apt term when we consider the bulk and weight of the machine. It isn’t the chunkiest gym-ready model, but it certainly isn’t going anywhere fast. Instead, this is a stable, secure machine that offers a lot to users in the home gym environment. Many gym bikes are classed beginner models for accessibility, but this one goes in the opposite direction. There are 23 programs, 32 resistance levels and a 9kg flywheel. Users can track their progress throughout all of these options, with data on the basics of speed and time, but also pulse readings from the wireless receiver. There is also the chance to create personal user profiles to make things even easier. This may all be a little intimidating for some, but it is ideal for those that want to push to the next level in fitness. 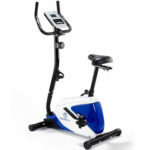 A key selling point with this top rated exercise bike is the idea of adaptability. The seat has seven different height adjustment levels from 4ft11 to 6ft 3. Therefore it should be suitable to most adults looking for the ideal rising position. 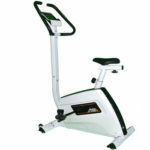 The step through low frame is also helpful for shorter users who often struggle to climb onto some exercise bikes. Many fear falling and injuring themselves while working out on taller models, which can impact on the intensity of the session and overall results. Here that is not the case at all and user can ride with confidence. Security also comes from the stabilisers and strong frame. The enjoyable, helpful workout from this Marcy bike also comes via the 4Kg flywheel and setting. There is enough weight here for a smooth enough motion, and a choice of eight resistance levels. This isn’t as broad as some machines, but is a good starting point. There is also the added bonus of the flip-out tablet holder. 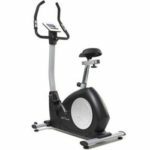 What makes this machine stand out from the crows is that this is an updated model that really tries to tick every single box for consumers looking for the most accessible, helpful home fitness bike possible. The design and the use of improved magnetic resistance are appealing for apartment owners after a nice starting point. There is a nice shape to the machine and a choice of either blue or red accents. Users should be able to get a pretty good workout from this machine. There is a 5kg two way flywheel, which allows for smooth pedalling and 8 levels of resistance. 8 really is the standard here. Users can then track their progress with a range of data from the LCD monitor. This monitor goes a little further than some competitor as it includes calories burned, an odometer and pules from sensors in the handrails. 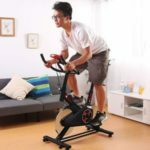 This Fronter programmable bike immediately loses some points compared to some of the top rated exercise bikes in this guide. This is all because of the look. The harsh white and strange angles are jarring when placed next to the black curves of modern machines. It doesn’t invite users to ride it in the same way as most modern machines. It might be older and out of date in looks, but there are still plenty of interesting, helpful features on board. There are 13 programmes here with a broad range of options. This includes with a body fat scanner and HRC mode. Some of the data is presented in a bar graph display, for an old fashioned quirk that many will actually appreciate. Users will also like the use of the 8Kg flywheel, the choice of static or moving hand grips, the transport wheels and the floor level adjustments. The appeal of this JTX model is all about the options provided for a diverse set of workouts. This is important to all those looking to keep things fresh and interesting as they struggle towards difficult goals. There are 21 pre-installed programmes here with some interesting approaches. They include watt training for theoretical power outputs, fat burning hill training and intervals. This means that more experienced users can try out new approaches for specific goals, but newcomers can also see what fits. Buyers will also appreciate all the user-friendly, accessible elements that add to the experience. There are quick start buttons, the data appears on a full colour monitors and there is a free chest strap. Users can also design four distinct personalised training programs once they get used to the settings and approaches. There are lots of different styles in these top ranked exercise bikes, and lots of interesting features. There is no doubt that cyclists and fitness lovers want something a little more than the typical, basic exercise machine in 2019. This is clear from the versatility in both the shapes and programming of these exercise machines. There are lots of options for spinning, HIIT, cardio, fat burning and more. Yet, those models are still accessible to newcomers and at-home users. This great blend of features, plus the quality in the build and data, show why these models are at the top of the class.